It’s weird to think it was so recent, but just a few years back, bingo sites were just bingo sites, and Dragonfish was arguably the biggest name in that particular sector. In 2015, things started to change, and Dragonfish sites started spreading their wings and stretching out into the online casino world, focusing predominantly on slots. The like of Bingo Hollywood, Costa Bingo, Foxy Bingo, and Moon Bingo all stepped out into the slots world, and their success saw more Dragonfish sites do the same. That meant that in 2016, the immensely popular Wink Bingo site took the big step, and launched Wink Slots, an online casino site that entered a hugely competitive industry with an established brand. This meant that Wink Slots had a strong chance of success in comparison with its rival sites that may not have boasted names with heritage to them, but at the same time, their chances being stronger than their competitors did not make them strong, because nobody gets an easy ride when entering a market that is as busy as the iGaming market was in 2016, and continues to be now. So, did Wink Slots put itself in a position to enjoy success in the online casino market, or should the site have just stuck to bingo? Wink Slots enjoyed some television adverts, and they want to make sure you remember that, so one of the first things you will see when you first visit this site is the phrase ‘as seen on TV’. This certainly isn’t a bad idea, because it’s worth reminding players that your name has weight to it. Also on the homepage is a collection of characters taken from popular games available at the site, and the blue suited man from the adverts, who is pulling a facial expression that is more than a little disturbing, one feels the photographer probably could’ve done a better job with that! 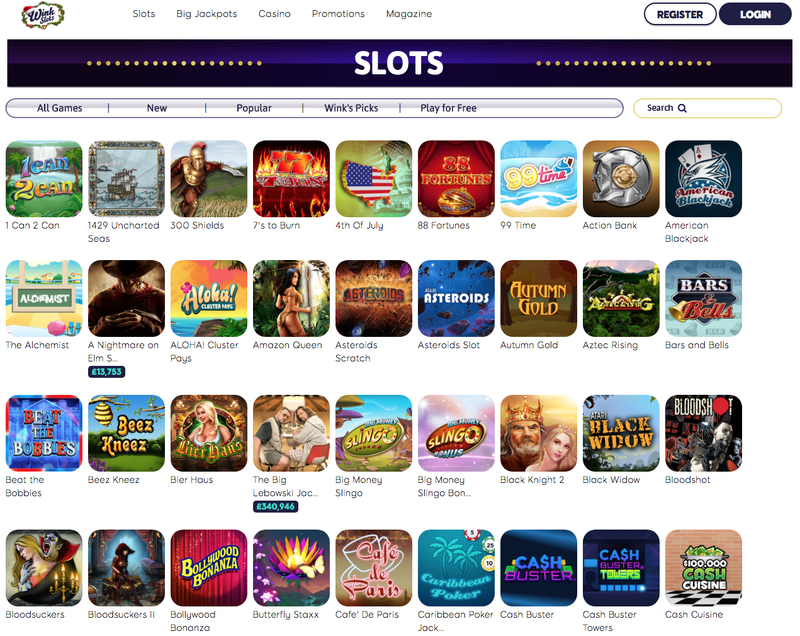 Having thumbnails of popular games on your homepage is pretty much a necessity in the design of modern casino sites, but Wink Slots has upped the level, having a mass of thumbnails that are all searchable via category, using sliding bars of thumbnails means that there are a lot of games accessible from the homepage, but it doesn’t take over the design theme too much, instead complimenting the general tone of the design perfectly. Wink Bingo became much-loved in the bingo market because of its gaming selection, and this concept has been carried over to Wink Slots as well. Titles on offer come from some of the very best software providers around, including 888 Holdings, Eyecon, IGT Interactive, NetEnt, NYX Gaming, OpenBet, PariPlay, SG Gaming, and Williams Interactive. There are a few notable names missing from this list, and one would hope that in time these will appear alongside the impressive collection that’s already there, but this is certainly a big enough group of developers to ensure that whatever their preference, players will find something to suit their needs here. As the name very much suggests, slots are the order of the day here. There is a courtesy offering of a few table and card games, but if you’re not into slots, this isn’t for you. If you are, you will find new releases such as Fiddle Dee Dough, Wild Wild West: The Great Train Heist, and Sharknado, alongside classics including Starburst, Jack and the Beanstalk, and Rainbow Riches. With a few jackpot slots like Mega Fortune available as well, Wink Slots is stacked with great options for slots players, making this a site that is well worth checking out, if you haven’t already.